Need to update, beautify or improve the functionality of your business or farm? Our products are strong, durable and great-looking, and will add instant value and efficiency. From Metal Roofing and Siding, to Shelters, Covers, Overhangs and Awnings - Dacraft™ can 'cover it'! Your business deserves the best, so let Dacraft™ supply you with the best metal roofing system money can buy! Whether you want a metal roof with a 'shingled' look, or the durability of an AG-Panel, our roofing systems are incredibly low maintenance and will last for decades. 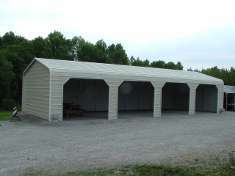 Whatever your shelter needs are, Dacraft™ can custom-design, manufacture and install to your exact specifications! 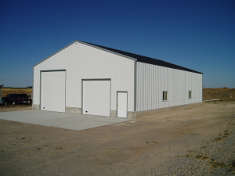 Storage shelters, boat and RV shelters, smokers' shelters, pole barns, loading & unloading areas - anything you need to preserve and protect from the elements - Dacraft™ can meet your needs with a durable, beautiful and efficient shelter! We design, manufacture and install several styles of window and door awnings - the Angel Wing, View-Through and Shield-All. Dacraft™'s awnings are custom-made with all-aluminum components in many color combinations that are sure to compliment your existing business or farm. Our awnings will not only enhance your structure's beauty, but also save you money by reducing the weathering of your exterior doors, door frames and windows.